Louisiana is a state with a long history and a rich culture. Before the arrival of Europeans, it was home to a series of Native American cultures. European settlement included colonization by both Spain and France, who imported black slaves from Africa. The British capture of what is now the Atlantic Provinces of Canada led to the migration of the Acadians, the ancestors of today's Cajuns. The Louisiana Purchase of 1803 brought Louisiana and other French possessions into the United States. The Louisiana state capital is Baton Rouge, also the home for a world-renowned institution of higher learning, Louisiana State University. Louisiana government has several features that have been inherited from its colonial period, including the use of the name "parish" for the administrative district that is known as a "county" elsewhere in the country, and a legal system that draws on French and other legal codes rather than English common law. 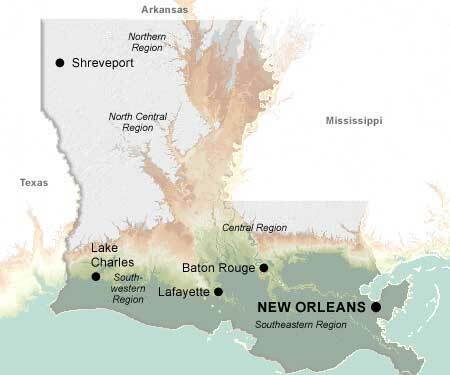 Louisiana's location on the Gulf of Mexico has been both a boon and a bane in recent years. New Orleans has always been important as the first major port on the Mississippi, but it's proximity to the Gulf exposed it to the violence of Hurricane Katrina. Deep water exploration for petroleum has brought well paid jobs, but the BP oil spill showed the danger of that strategy. Through it all, Louisianans have proved resilient to adversity and welcoming to visitors. The state has an incredible variety of experiences to offer. New Orleans is the recognized birthplace of jazz, which still rings out in the French Quarter. Despite concerns generated by the spill, the coast remains a mecca for fishermen. Historical vestiges of the 19th century when cotton was king can be found throughout the state.